The fact that the island of Zakynthos was the subject of foreign occupation throughout its rich history is evident in its arts and cultures, which show a mix of styles from different countries and era's blended together in a way that is uniquely Zakynthian. The architecture on Zante has mainly been influenced by the Venetians, this is most evident in the Capital town although there is also a Byzantine feel as well as some Neo - Classical architecture. The churches on the island show original architecture, as the bell towers are separate from the main Church buildings, often they are very ornate and some even seem to show a Gothic influence with elaborate carvings. The traditional Zakynthian songs of 'Kantadas' also have a strong Venetian feel, as they are sweet romantic melodies reminiscent of Italian arias. 'Kandatas' are in fact unique to Zante and the Ionian Islands and are not found in Italy. The Venetians promoted the theatre on Zante during their time on the island. They were responsible for building the first theatre on the island. It was also during this time that the Nobility held private plays in their houses; the famous Zakynthian 'Omilies' which focused on social struggles between the rich and the poor. 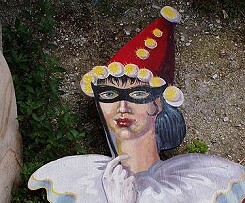 Omilies are still staged today, during carnival time the plays are acted out in the town squares. Although being a small island Zante has produced more famous poets and writers than anywhere else in Greece. They all seem to have been inspired by the beautiful countryside and surroundings. The most well known Greek poet is Dionysios Solomos, who wrote his masterpiece 'Hymn to Liberty' on Lofos Strani hill, near Bohali in the south of the island. The words from this poem later became the words for the Greek National Anthem. Other famous writers include Andreas Kalvos and Grigorios Xenopoulos. However the enchantment of Zante was not limited just to those who were born on the island, or who were Greek, as the American poet Edgar Allan Poe wrote a fitting poem about the beauty of the island in his work called " Sonnet to Zante". The influences on the cuisine of Zakynthos are known less about, than other areas of arts and culture. The food does not have a strong Italian influence despite the years of Venetian occupation, although some dishes may be similar due to the same produce being grown in both countries. It is claimed that it was the Venetians who introduced tomatoes to Zante. The island through having such fertile soil is exceptionally lucky in that almost any crop will grow here, meaning that many types of fruits and vegetables can be found and are used in the local dishes. The most well known Zakynthian dishes are probably Stifado and Kokkinisto, both of which are meat dishes. Zante is also known for its sweets 'pasteli' and 'mandolato'. Even nowadays Zante has a rich arts scene, with many artist producing ceramics, pottery, lace, weavings, carvings and paintings using a mixture of modern and traditional techniques. For more detailed information about the arts and culture of Zakynthos please follow the relevant links.